When I was doing my research on the places to see, I had to make sure that was something for Xena each day so she wouldn't get bored or restless. All google searches on this always led me to the Puffing Billy Railway. Even friends with kids who had been to Melbourne had told me that Xena would love it (though they did warn me that it can be a tad meh for grown-ups). So I put it in our itinerary right away. I also kept telling Xena about it, so she knew that Puffing Billy was something she was going to enjoy. As I got her ready that morning, I asked her, "Where are we going today?" She exclaimed, "Puffing Billy!" 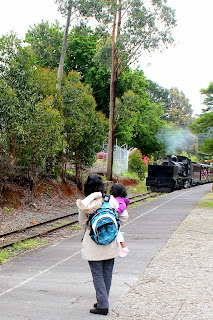 The Puffing Billy is Australia's oldest steam railway. It was one of the four experimental low-cost, narrow-gauge (762 mm) railway lines built in the early 1900s to make rural areas more accessible. Timber, potatoes and other goods were carried using this railway, and sometimes it had weekend tourists too who wanted to enjoy the scenery from the train that meandered through the forests, fern gullies and farmlands of the Dandenong Ranges for over 29 km. It was in operation from 1900 to 1953, when a landslide blocked the track. Due to operating losses, officials had already been considering closing it. The landslide gave them the perfect excuse and the line was closed. Public interest resulted in the formation of the Puffing Billy Preservation Society in 1955, whose volunteers raised funds to bring back the days of this ancient relic. The line was reopened and continues to operate today on its original track as a major tourist attraction. Run mainly by volunteers, it has very few paid employees. 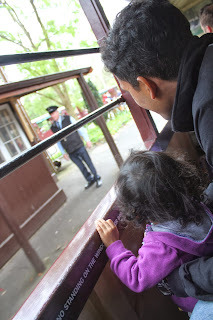 It is very popular with kids who like to sit in the open-sided carriages with their legs hanging out (yes, it is allowed) towards the views. We decided that doing the full return journey would take long and would get boring even for Xena so we decided to do a short trip -- from Menzies Creek to Emerald Lake and back. We drove to the Menzies Creek station, named after an early miner who worked in the area. We were quite early, so after having a chat with the friendly station master (who looked like he was straight out of a children's story book! ), we decided to walk around and take photos. It was a beautiful day, cool, but not too cold. At one point, it even started drizzling, but that lasted exactly 30 seconds. We found this empty cart and she had a fun time playing on it. Grandpa and granddaughter pose on the bench. Anyone knows what bird this is? We sure saw a lot of them during our trip. They looked like crows, but were much cleaner and shinier, and with a prominent white patch down their backs. The newest volunteer of the Puffing Billy Preservation Society decides to clean up the station using a stick. Xena snuggles up to her dad as we wait for the train to approach. And here it is! 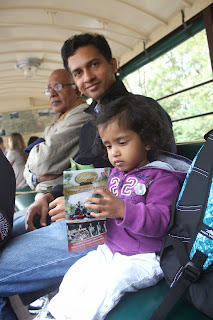 Xena was so excited she kept pointing to it and saying, "Puffing Billy aa gaya!" She was super thrilled when she saw the steam and said, "Dhuan dhuan!" The guard whistles and off we go! Xena asking (with her signature two-hands-in-the-air pose) - "Puffing Billy kahan gaya??" 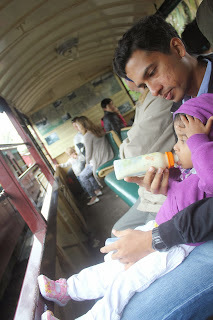 Most kids sit in the Puffing Billy with their legs dangling out, but Xena was too tiny so Viv had to hold on tight. 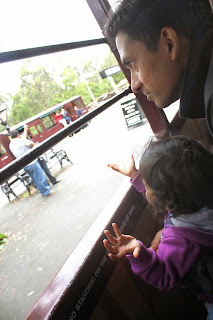 I must admit I quite enjoyed myself as the train puffed through the forests of the Dandenong ranges! Zzzz... she fell asleep in the train! She stayed asleep as we got lunch at the Emerald Lake Cafe. Puffing Billy sure made its mark on Xena who still talks about it, especially if she spots steam anywhere. The other day, I was boiling water in the kettle. She saw the steam coming out of the spout and exclaimed, "Just like Puffing Billy!" Next up - Dandenong Ranges and Skyhigh!